Today, I’m in beautiful Asheville, North Carolina, speaking at the NCDL annual conference. My contribution to this conference is a task that befalls all educators and education reformers today, telling the new story. How are we going to retool the teaching and learning experience so that it is relevant to our students’ world view, if we continue to hold on to the old stories. What are the new stories, and what is their shape? 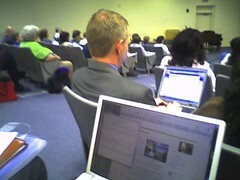 “2006 Conference.” Distance Learning Alliance. NCDLA. 15 May 2006 . My name is Myron Jones, Director of Sales, Fayetteville Area CVB, Fayetteville NC and I would like to offer Fayetteville as a possible host site for one of your upcoming conferences or conventions. I am positive our facilities and accommodations will exceed your expectations. Fayetteville has new as well as newly renovated properties that exceeds your expectations. You may also visit our website at http://www.visitfayettevillenc.com for more information or you may contact me at 910-483-5311.